This non-magnetic MRI hand grip is constructed entirely of non-ferrous materials. It is specifically suited for use in MRI rooms. All materials including fasteners are either non-ferrous materials or special polymers. 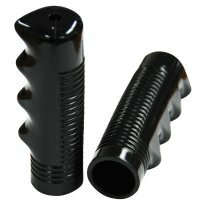 Black plastic grip for wheelchair push handles, helps attendant grip tubes to push the wheelchair. This grip is placed on the push handle of the wheelchair, ribbed grips for a better grip and firm hold of the wheelchair.